Why do you need endodontic retreatment? Sometimes it is necessary to retreat a root canal because of infection after initial treatment. When root canal therapy fails to work as planned, the treated tooth may heal improperly or cause complications that could jeopardize both the tooth and your health. Most cases result from inadequate root canal therapy, complicated canal anatomy or oral bacteria contamination from a leaking restoration. Endodontic retreatment, also called root canal retreatment, involves your Holland Endodontist removing existing root canal material, cleaning canals and filling and sealing the space with a temporary filling before final restoration. This procedure, except for the structural removal, is nearly identical to the original procedure and usually results in a positive outcome for about 75% of patients. Root canal treatments and retreatments often are better alternatives than extraction for most individuals. A tooth with strong bone support, a solid surface and healthy gums beneath it, can be saved. In addition, root canal retreatment will usually be more affordable than dental implants, extensive bridgework or prosthetic teeth. These other alternatives also require routine maintenance and feel less natural than a real tooth. Dr. Buurma and his team specialize in endodontic retreatment procedures and can repair your tooth and the surrounding tissues to their original look, feel and function. While some individuals opt for tooth replacements, there exists no better option than keeping your original tooth. Endodontic retreatment offers most patients the option to maintain their healthy, functioning and natural tooth for many years to come. If you would like to know if endodontic retreatment is right for you, Dr. Buurma and his staff can help you understand your options and choose the best solution. 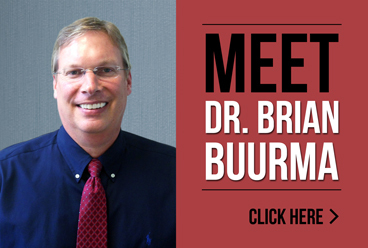 For more information about Brian Buurma DDS or root canal retreatment, please contact our office or call us directly at 616.994.9722.